Get noticed by more customers with UPrinting’s wholesale flyer printing. Unlike ordering flyers in small quantities, printing by bulk lessens the cost per page. This helps you cut on your promotional costs. 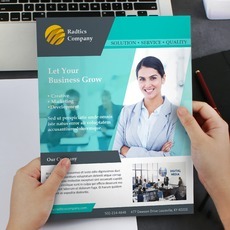 Both large and small scale businesses hand out flyers at places with high foot traffic to increase their chances of converting a person into a client. Revenue is one of the reasons why you started your business in the first place. You want to earn more and make your brand the top choice of people. At UPrinting, we offer you cost-effective printing services. We have fast printing times for our business flyers, club card flyers and die-cut flyers. Our basic printing time for 50-200 business flyers is 2 business days and 3 business days for 500-100,000 prints. All you have to do is select your options, place an order then leave the work to us. If you need more information about wholesale flyer printing, don’t hesitate to call us at 1.888.888.4211 or launch our live chat.